Greenbriar Picture Shows: How Far Can A Public Be Uplifted? How Far Can A Public Be Uplifted? You'll thank us for making it, even if you don't come see it, was seeming Metro message to a public they wished would support The Magnificent Yankee, but hang those gum-poppers who wanted comedies and melodramas and westerns. Still, The Magnificent Yankee could go far arguing that movies had more to offer than empty genre calories. MGM had punted before for prestige sake. Occasionally that had value even over profit. Let The Magnificent Yankee lose $465K so long as Leo's patriotism was burnished, 1950 a time when never enough of that could be had. "A credit to the industry" said Metro marketers to showmen who'd immediately smell fish. They'd seen this dodge before and suffered for taking the bait. "It is just about one of the best, and in playing it and promoting it, you will win for your theatre the gratitude and respect of your community." Such high-minded talk translated quick to: You'll lose your a--, but feel good doing it. 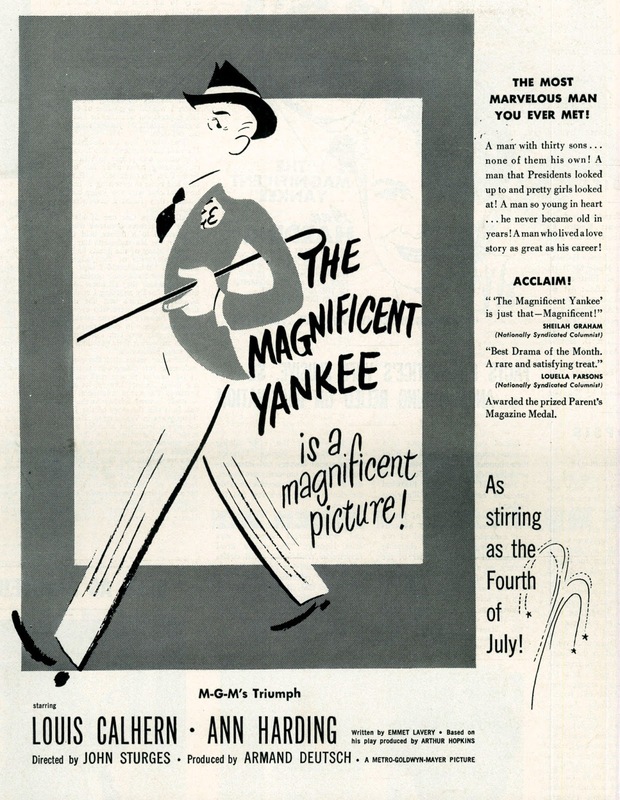 Trouble was, no matter how cheaply MGM made small pictures (Yankee's negative cost $638K), they'd still wind up in the red. You couldn't blame old timers for saying the company was on fumes. And here came Dore Schary with a film about a Supreme Court Justice back in 1902. 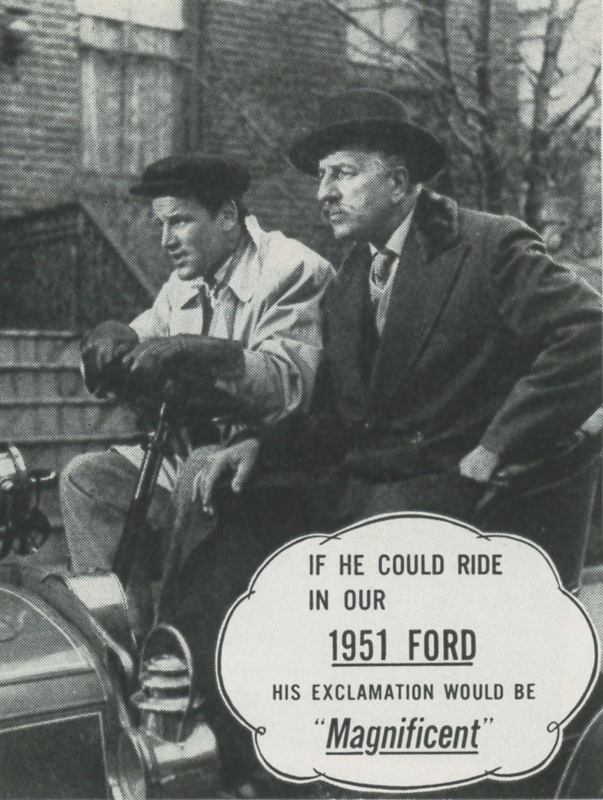 Ads had to conceal both the content and the period setting, plus total dearth of names (Louis Calhern the lead). Whole of the campaign would turn on reviews, which were laudatory to a fault, but where's the good when other aspects of The Magnificent Yankee had to be hid? Metro did two trailers, both accessible either at You Tube or as an extra on the Warner Archive DVD. One features Lionel Barrymore pitching for the film, describing Oliver Wendell Holmes as a "rough, tough, sort of man," but also a "genial giant." This came under heading of anything to imply action, which The Magnificent Yankee did not have, unless verbal arguments could be called action. It's easy to imagine East Coast merchandising turning up collective noses at what experience taught them would be a hard sell, and no one drawing checks based on performance liked hard sells. Failure would only invite blame from Culver, as in You Didn't Sell Hard Enough. Movies like The Magnificent Yankee were in the end a no-win game. Trades reported a May 1950 week that Metro staff and researchers spent in Washington getting Supreme Court background, cooperation assured as The Magnificent Yankee would be a 100% positive depiction of the court and its workings. They'd be back in June to shoot four days of location footage, virtually on heels of the Born Yesterday crew, which had just finished up in Washington. 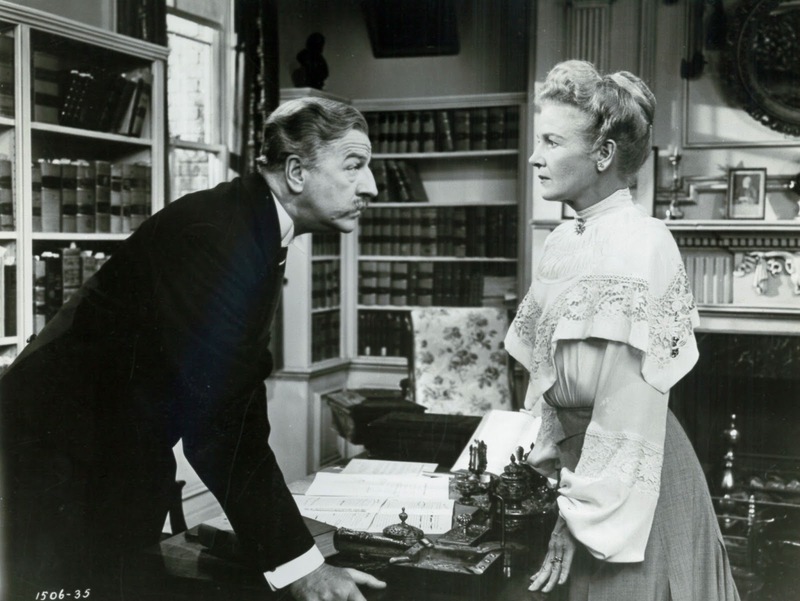 Historical, said Variety, was a percentage deal given Emmet Lavery, author of the play on which The Magnificent Yankee was based, him to also pen a script for the screen adapt. 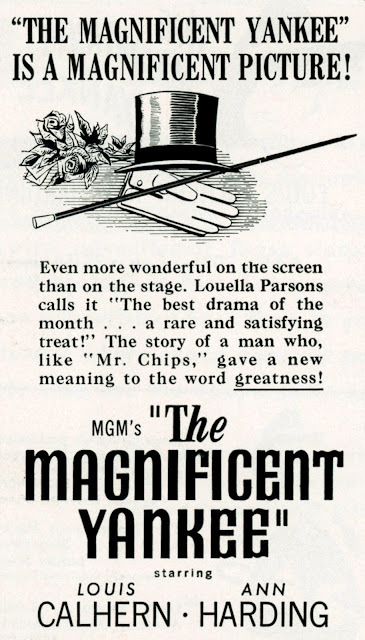 MGM had evidently not cut scribes in on profits before (as it turned out, of course, Lavery got no additional coin, as there were no profits). 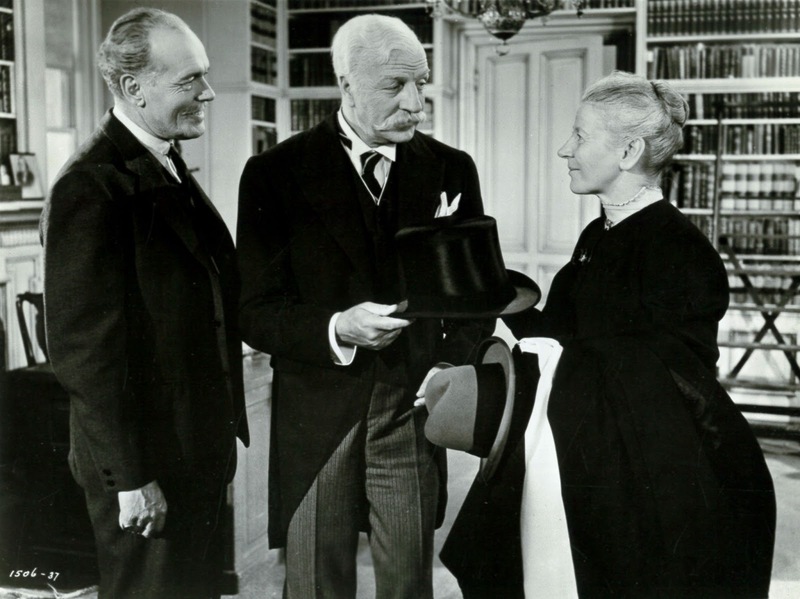 Metro prided itself on historical clarity and verisimilitude, this tested by exhaustive search for a photo of Fanny Holmes, wife of the title character and played by Ann Harding. Turned out there were no photos in existence of the woman, whereas there was plentiful visual record of her husband. Inquiry revealed that Mrs. Holmes had been sickly before and during their life in Washington, and refused to sit before a camera (her hair was cut very short due to the illness and didn't grow back). I checked Google for possibility of an image turned up in the sixty-eight years since The Magnificent Yankee was made, but nothing. 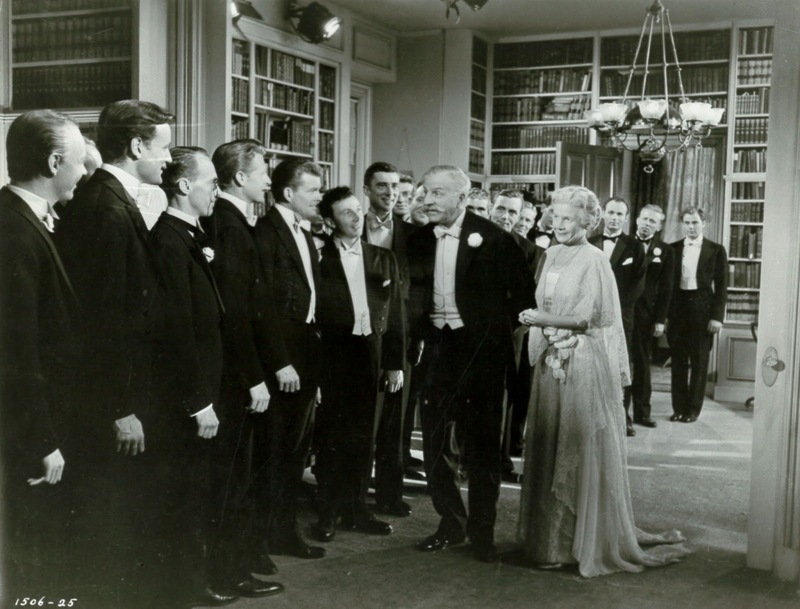 Toward speed and economy, there were ten days of rehearsal for The Magnificent Yankee under direction of John Sturges, to be followed by 22 days of shooting. MGM under Dore Schary was watching out-flow of dollars. 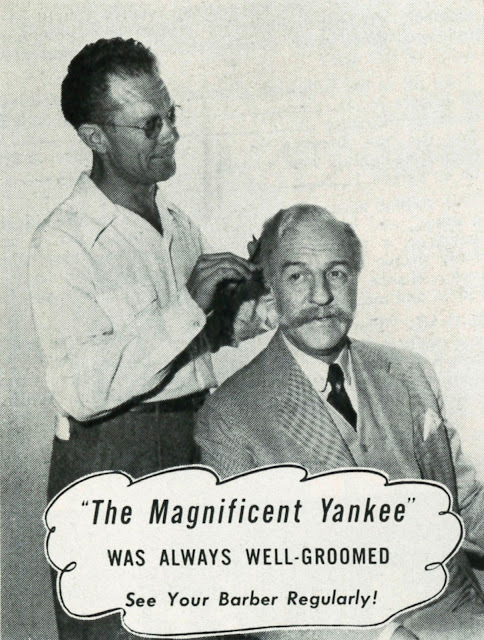 A timely boost came in August 1950 for The Magnificent Yankee. Major segment of the film had Justice Holmes ruling against free speech where it posed a "clear and present danger." The concept was revisited by the 1949-50 court when a group of Communists appealed a decision which said they had no right to espouse the Red cause as that was violation of the Smith Act, which made it a felony to teach and advocate violent overthrow of the U.S. Government. The Supreme Court upheld the conviction and declared the Smith Act constitutional. Yankee's emphasis on the Holmes ruling put Metro foursquare with the Americanism theme pushed hardest by the film, as well as emphasizing the company's opposition to present-day Un-American activities, this another means by which Leo and The Magnificent Yankee could prosper whatever the economic outcome. 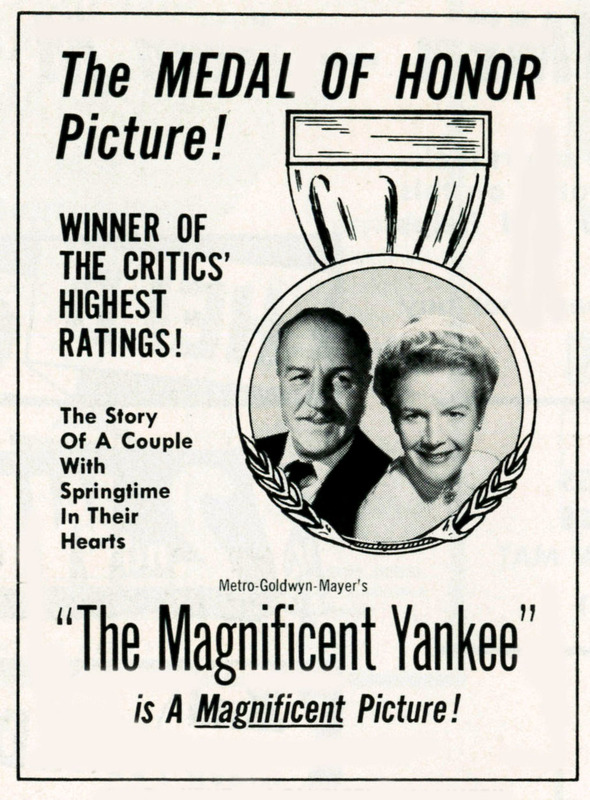 Metro began sneak previews of The Magnificent Yankee in October 1950 and realized they had makings of a critical success and possible award winner. There were also "academia" screenings and an unspool for the Supreme Court, to which five Justices showed up. Decision was made to open The Magnificent Yankee in December to qualify for Academy consideration. L.A.'s 4 Star Theatre, recognized as a "sure-seater" (art house) was chosen for the invitational premiere. A special trailer was made for the 4 Star opening, which is still extant and a bonus on the Warner Archive DVD. MGM opted for a "soft-spoken, homey, and 'sincere' approach" for its radio campaign, no hard sell or sound effects for "spot blurbs." The appeal would aim at stations listened to by adults, including classical music outlets. Test of the approach in L.A. would determine viability of a similar policy for national release. Gotham booking was at Radio City Music Hall for January 1951, with a stage extravaganza entitled "Red, White, and Blues," which, said Variety (1-24-51), ran the gamut "from opera to voodoo and swing." Two weeks of "fair," then less, play, saw The Magnificent Yankee out of the Hall. The trend tended toward strong initial days or weeks at urban sites, then steep or steeper drops. Hinterland stops saw The Magnificent Yankee at tail-end of double bills. 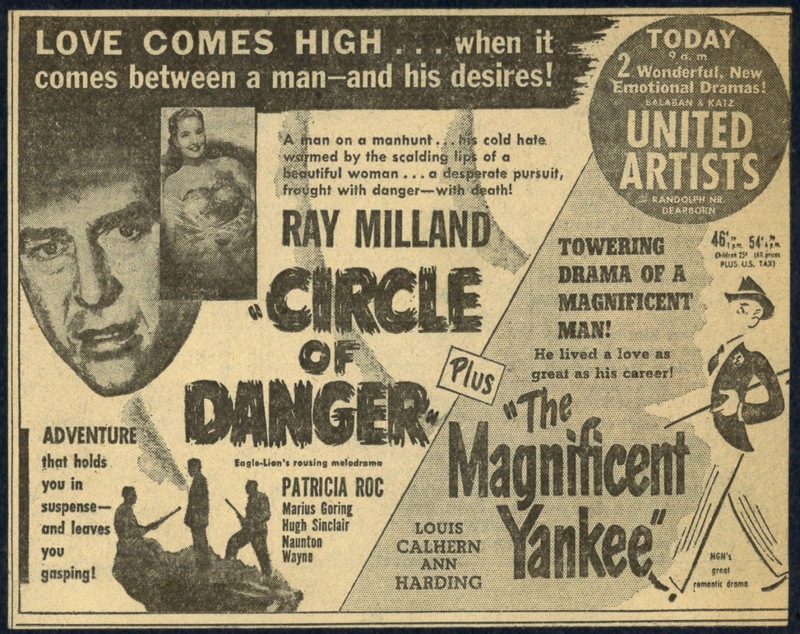 Generally, something with action led the bill, like in Chicago where Yankee backed up a Ray Milland thriller out of Britain, Circle Of Danger. None of this would surprise Metro handlers, who knew from disappointment over "offbeat" merchandise. 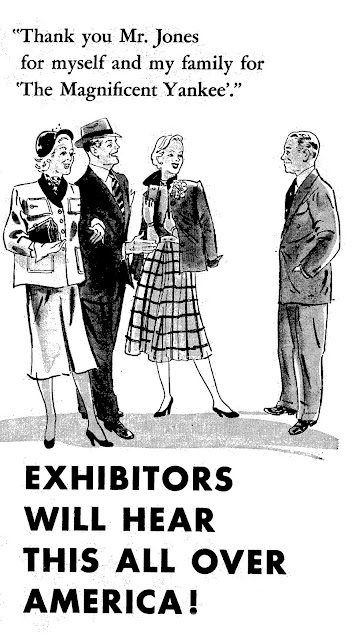 Sales veep William F. Rodgers maintained, however, "that experimentation is necessary, for there can be no formula in anticipating public taste." Rodgers referred to Stars In My Crown, The Next Voice You Hear, and Night Into Morning as others of "different" persuasion, each out of Metro in 1950-51 and all to lose money. Sales staff was instructed "to make any kind of terms ... within reason" once a problem title was recognized. 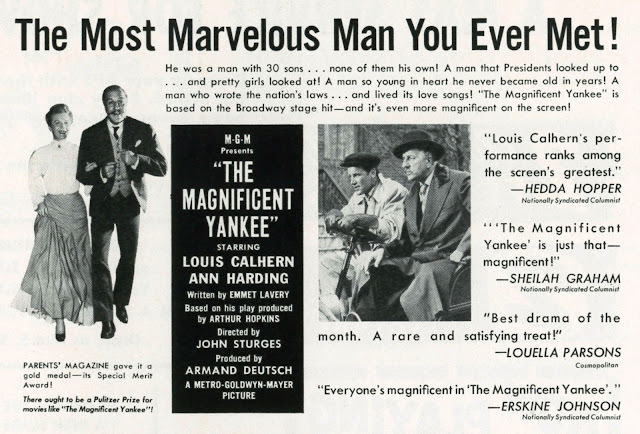 Viewers induced to see The Magnificent Yankee enjoyed it, but there was the rub --- getting them in. 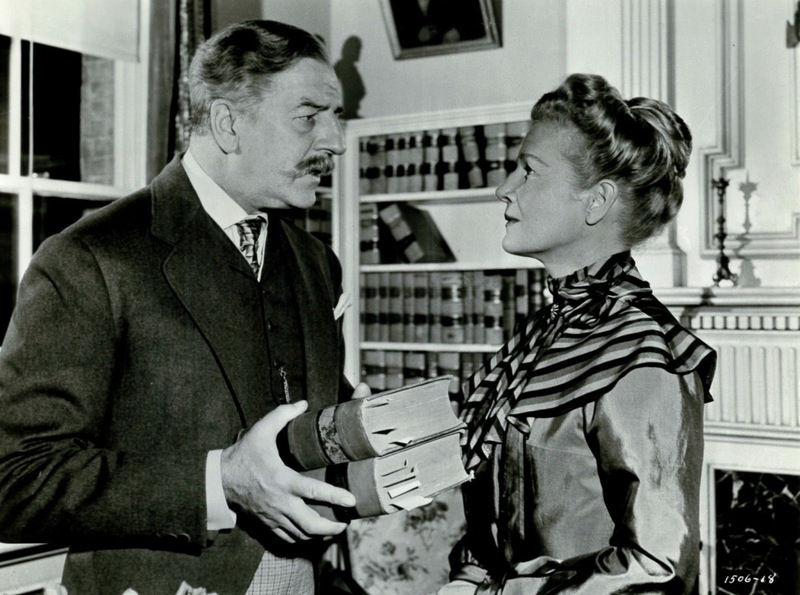 The film was safe and civilized to a fault, for Justice Holmes did nothing dramatic beyond dissenting often with other sitting judges, and where was excitement in that, unless you were a legal scholar? Still, it was the sort of output Metro could point to with pride when sourpusses later hung crepe over things like Rogue Cop or Flame and The Flesh that appealed to a baser audience. Reminding people to pay taxes doesn't seem to be the right way to promote a movie. Could never get into this cinematic civics lesson. Mr. Calhern was a great actor - no doubt about it. But his Oscar nomination that year should have come in supporting for astounding work in "The Asphalt Jungle". 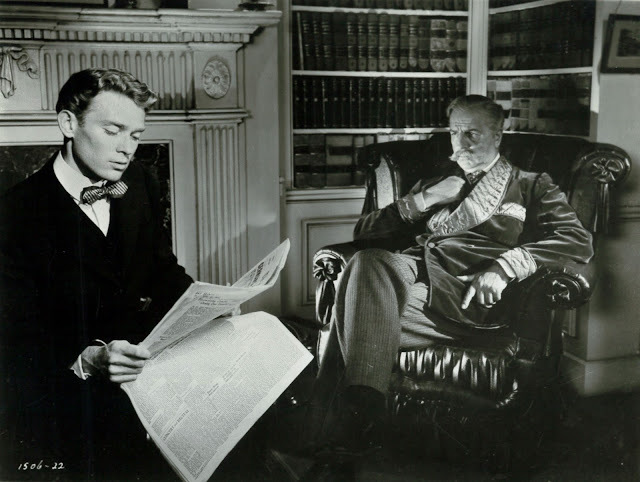 1950 offered a bumper crop of superb male supporting performances. I'd have nominated Charles Kemper (Wagon Master), Sam Jaffe (The Asphalt Jungle), Marc Lawrence (The Asphalt Jungle) and Zero Mostel (Panic in the Streets). 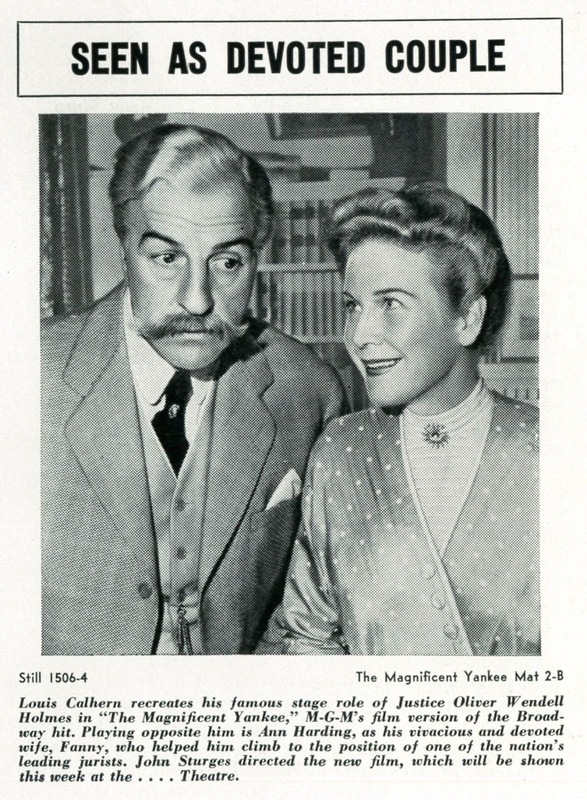 But even in that heady company Calhern was best in show. 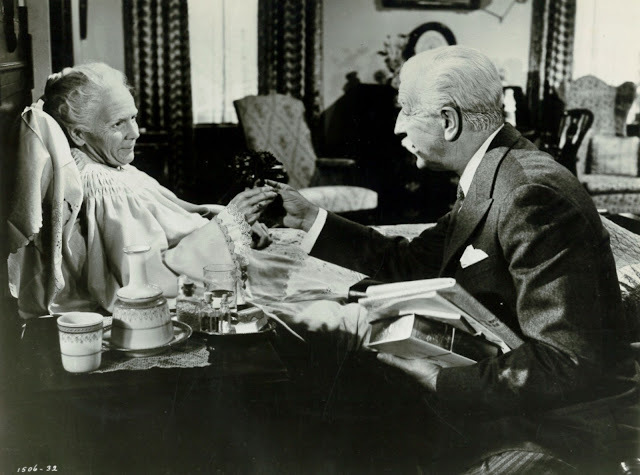 Oliver Wendell Holmes was a towering judicial intellect much appreciated by the progressives of his time, which is probably why there was a Broadway play about him and this movie adaptation. 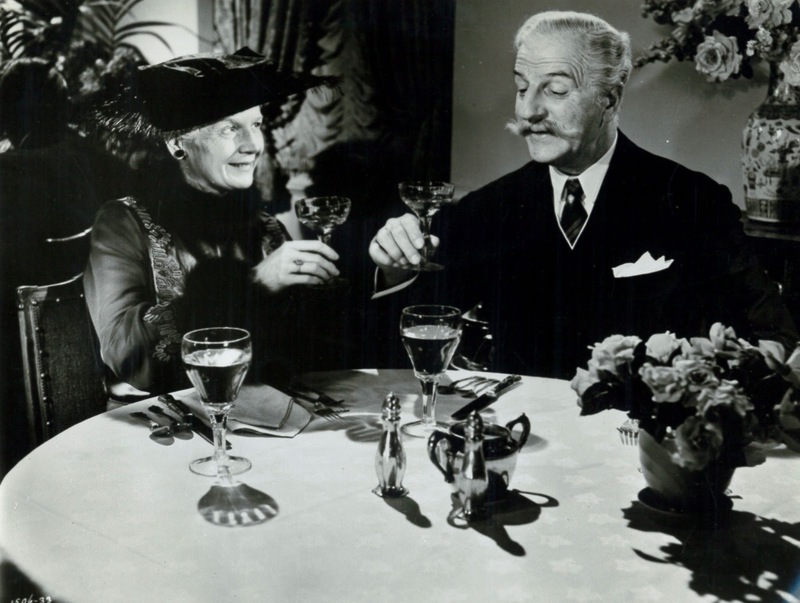 The world of jurisprudence, however, is just the context for the real story of a quirky, domineering man, very much of an earlier generation in manner and outlook, and of the genteel wife who understands and loves him. It’s very similar to “Life with Father,” only without the children. 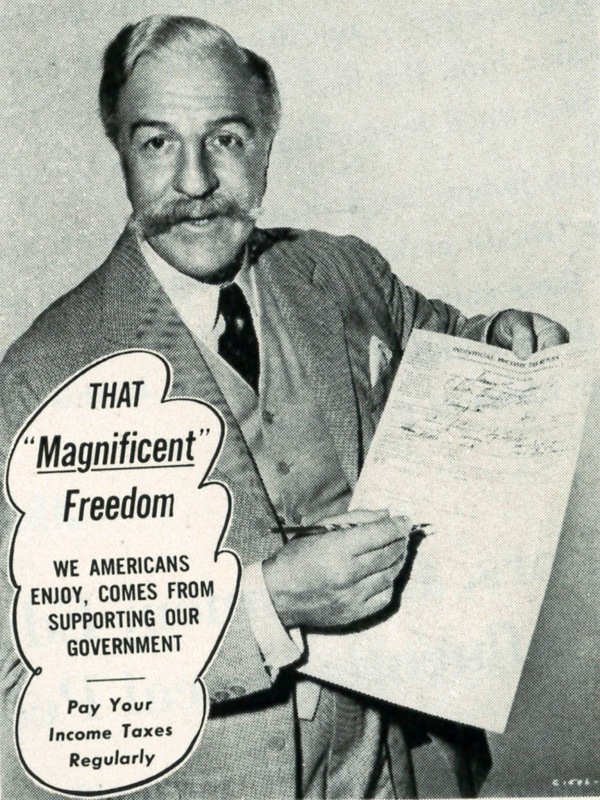 Even their absence, however, is compensated for by the thirty law clerks Holmes mentored during his service as a U.S. Supreme Court Justice, as typified by Jimmy Lydon, who was also one of the children in “Life with Father.” Had the studio played up this angle, it might have gotten back the modest negative cost of “The Magnificent Yankee” from a public which preferred its jurists to be like Judge Hardy. As it was, Dore Schary was discovering that there was a big difference between saving money and making money. Stinky agrees with CanadianKen: Louis Calhern is a great actor, and his performance in The Asphalt Jungle is one for the ages. 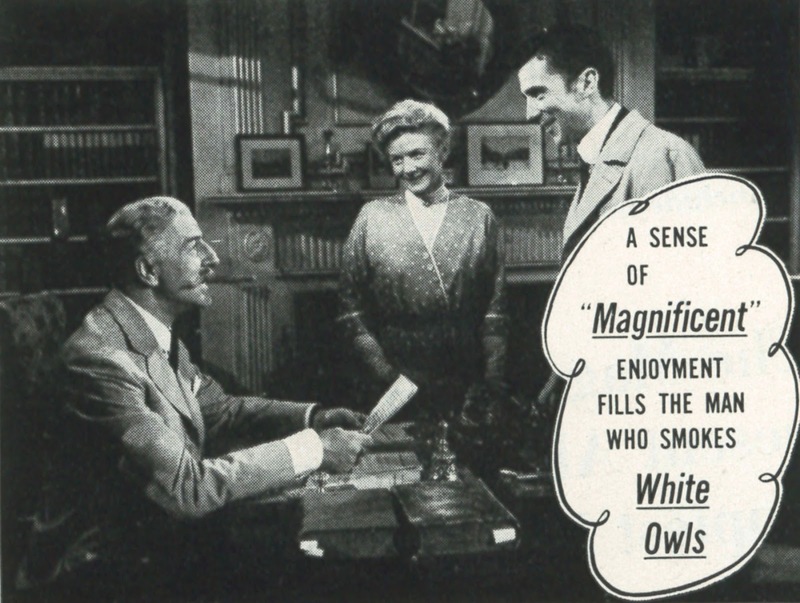 Interesting that "uplifting" films used to be offered as PR for the entire industry. In the last few decades, moviemakers who sell their work as "uplifting" tend to position themselves against the industry, which is decried as too smutty, too corporate, too political (either direction), too unreligious, etc. Advertising and interviews often take the line it's your duty to support this picture, lest people you don't like take over the world. Movie critics, for example -- How dare they try to tell you a movie is good or bad! Show up those elitists and come see "Trial of Billy Jack"! For all I know "Benji" was a fine dog movie, but I was turned off by commercials of Just Folks rhapsodizing about how it was the only Decent Family Movie in general release. There are Amazon reviews of great old flicks that confine their comments to how clean and wholesome they are, compared to everything made after 1960. This bothers me, because I fear unwary young browsers will get the idea that Laurel and Hardy are nothing more than two guys who don't swear. @Donald Benson; it isn't the comments about cleanness and wholesomeness that will turn off younger viewers as it would/will be whatever racism, sexism, and lack of minorities (or dated depiction of thereof) that's in older movies, IMHO.